Having a successful IT career is much more than just having the technical knowledge and expertise. Most successful IT Resources have one important commonality; impeccable interpersonal or soft skills. 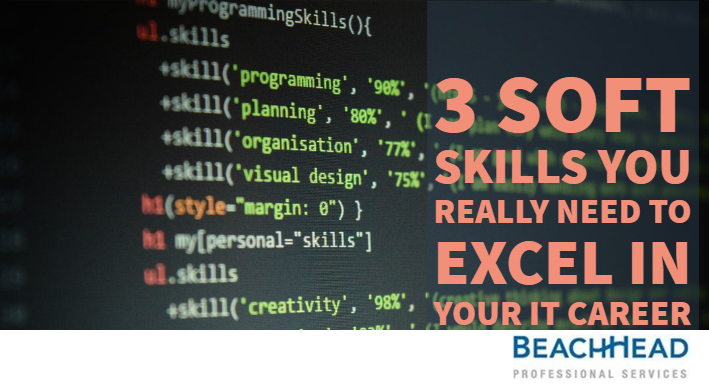 So, if you’re trying to make an impactful career in the technology field, below are the top 3 soft skills you really need to excel. Interpersonal skills are the most important trait that most of the employers would assess before hiring an IT professional. These skills cannot be taught in a classroom or measured on paper but are reflected in your overall personality and the way you work with others. A recent joint survey by LinkedIn and Capgemini reported that people with strong soft skills are much more in demand than the people just trained in hard or technical skills. Here are our tips to develop some of the most coveted soft skills in the IT field. IT projects often require collaboration between different teams, departments, and divisions. As a contractor or employee, you will often have to work and perform within a team of professional rather than an individual. Generally, a “lone wolf” approach isn’t the right fit for a great IT career. It is highly important that you demonstrate the willingness to collaborate with the members of different teams and enjoy working in partnership with others to accomplish the company’s goals. You should be able to communicate your ideas effectively, listen to others’ suggestions, familiarize yourself with the workflows of different teams and work collaboratively across every business line. An added asset would be good conflict resolution skills. If you can switch effectively from being a leader to a team player and vice versa you will be a great asset to any company. Being technical, you will always be interacting with individuals who are not as technology savvy like you. You will often end up in situations where you have to explain intricate coding, languages or applications in an easy and digestible manner to your colleagues and maybe other stakeholders of the organization. When you start facilitating good communication patterns on a daily basis, you not only get the work done but also ensure that your team is high performing and happy. Whenever you can, practice speaking in a clear, concise and confident manner. Practice expressing the who, what, when, where, why and how of a project, task or a situation clearly and in a way that is effectively understood by your team. A great way of practicing your speech is to think before you speak, essentially frame the questions or answers in your mind before saying out loud. You can also record your speech to spot out the errors later. Practicing your speech will not only boost your confidence but will also help you to extract clear expectations from your manager that can help you deliver great results. Professionalism can mean different things to different people. People often take it as one skill in itself, but in reality, professionalism is a combination of many different soft skills that are extremely crucial for you to create a successful career. Professionalism stems from the inherent values of an individual to conduct yourself with responsibility, accountability, honesty, integrity, and excellence. These are the values that are reflected in the way we listen, show empathy, communicate, demonstrate self-confidence and give and receive feedback. Acting with professionalism also means building an effective relationship with clients, colleagues, and superiors. Professionalism would also be maintaining an appropriate attitude and communicating effectively in order to be productive. It is also reflected by your arriving to work on time, dressing appropriately, speaking clearly and politely and also ensuring a high standard of your work at all times. There you go! We just gave you 3 stepping stones to build your career in any field that you choose. But if you’re an IT professional remember, technical knowledge is a must for you to succeed but in order to reach that highest level of management hierarchy, you need to hone both your personality and skills. So, practice developing these skills now and watch yourself reach the pinnacle of success with BeachHead. Ready for a new role? Send us your resume at info@beach-head.com and we will help. Remember to like us on Facebook and do follow us on Twitter and LinkedIn. Apply to all our latest job openings here.